During the first year of life, babies are communicating their needs through crying but it isn’t always the easiest to figure out what their different types of cries mean. Within the first month, you will begin to pick up cues from your baby’s cry. Most of the common reasons behind a babies cry include being tired, hungry, having a dirty diaper, teething, feeling too hot or too cold, stomach issues, or overstimulation. When none of these seem to help ease your little one try one of the following techniques to help soothe your crying baby. Babies love rhythmic motions. It can help calm them down; the swaying movement brings them comfort and reminds them of what it was like in the womb. Try to gently rock your baby in your arms or in a rocking chair, this can have a peaceful and calming effect. Sometimes during those early months, your baby doesn’t quite know how to self-soothe, something as simple as a car or stroller ride can help bring them ease. Just remember that once your baby has fallen asleep it’s important to place them into their crib on their back. Swaddle your baby to help soothe their cry. While it may seem a bit odd having them bundled up in the tightness of the swaddle, doing this should help bring them comfort and feel more secure. Another way to create that close comfort your baby is craving is to try kangaroo care. Kangaroo care is where you are skin to skin with your baby while they are still in their diaper and you have a blanket covering the two of you. Touching skin to skin can help make your baby feel comfortable and stop their crying. While your baby was in the womb they would hear the constant sound of your heartbeat, the swishing of the amniotic fluid and other noises that would take place around them. White noise machines are great in replicating the steady rhythm of noise and sound. If you don’t have a white noise machine no need to fret, try out one of your common house hold items like a fan or vacuum. The constant steady noise can have a very calming effect and hopefully stop their crying, just be sure that the noise isn’t too loud. Gently hold your baby on their side, stomach or hold them against your shoulder. This position is especially comforting for newborns since they feel more at ease being on their side or stomach. Just remember this position is to help soothe them and is not meant for them to sleep this way. Always remember if your baby falls asleep during any of these techniques, be sure and place them in their crib on their back. If you’ve ruled out any of the main causes of crying and none of these techniques seem to soothe your baby on a continual basis talk with your baby’s healthcare provider. Want more tips for comforting your little one? 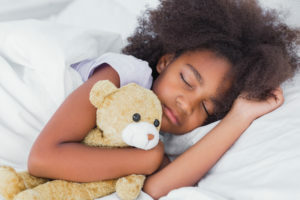 Does your child have a lovey? If they do, check out these tips. Comforting your baby is one thing, but what about comforting your older child? Check out these tips! Previous Previous post: What is a Pediatric Speech-Language Pathologist?